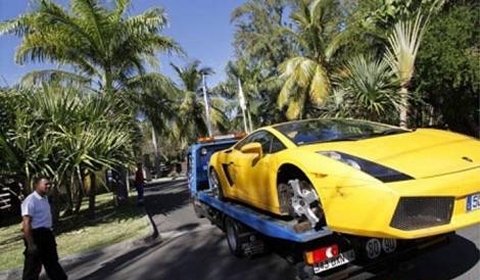 Real Madrid soccer striker Karim Benzema has written off his personal Lamborghini Gallardo on the Reunion Island while celebrating his birthday. The accident happened while the French soccer player was driving to a party from the hotel where he was staying. Local media suggest a race was taking place between the yellow Lamborghini and a Porsche. It is unclear which supercar Benzema was driving. The Lamborghini suffered major damage to its front right panel, right front tyre and rim. It is not the first time he has been involved in a traffic accident. In November he smashed his Audi into a wall near his home in Madrid and walked away unscathed.